Every aspect of modern society has diverged too far. Modern society considers it to be progress. Basically, the result of over-divergence is that everything is unnecessarily complicated. 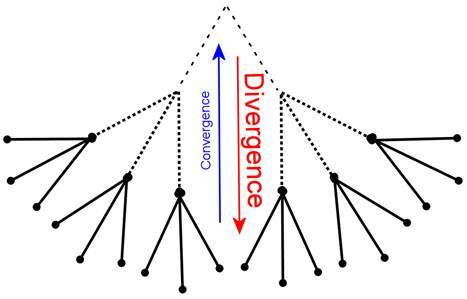 As explained in many of my theories, divergence is a thought process: it is expanding (i.e. not deductive reasoning), dividing, separating, or contrasting thoughts/information. It is serial processing, finding difference, or descending the hierarchy. The products of divergence are specific, unique, or different things. The opposite is convergence – connecting things. The world lacks and sorely needs convergence. I believe a balance of convergence and divergence is ideal. This image represents over-divergence. The top of the hierarchy has dotted lines to represent the weakening of convergence in modern society – nothing is connected. The bottom of the hierarchy has solid lines to represent the strengthening of divergence – everything is separating. In technology, over-divergence results in many unique electronics. Standardization is convergence. A good example of a standard is USB, Universal Serial Bus. Before USB, we had separate ports for the mouse, keyboard, gamepad, printer, and so forth. In the realm of cellphones, over-divergence is known as fragmentation: applications don’t run on certain phones due to different hardware and software. The solution is simply to standardize: make a minimum hardware requirement and a software standard, and update these standards yearly or so. All manufacturers would want to adhere to the standard to stay relevant. The reason standards don’t exist is because of a lack of (competent) overseers. We have a computer dedicated to video games (i.e. console), a screen and speakers dedicated to games and cable (i.e. TV), another computer with screen and speakers dedicated to using the internet (i.e. laptop), and so forth. This needless redundancy is the result of over-divergence. Luckily, we have the convergence of all these applications in the smartphone. Aside from standardization, there is no one at the layman level working in the computer industry. Everyone in the computer industry is a specialist. Generalists do not exist to apply convergence to the products of specialists. If they did work together, their lack of expertise would be the subject of ridicule from specialists. Say, for example, Average Joe downloads a video on his laptop and wants to play it on his big-screen TV through his networked PS3. He does not have time and effort to learn about IP addresses, reconfiguring routers, UPnP settings, port forwarding ranges, HomeGroup passwords, Workgroups, and junk. This stuff should just work, but doesn’t because Microsoft has a thousand specialists working in the UPnP department, and another thousand specialists working in the HomeGroup department – over-divergence. I suppose Apple Computer may employ a few generalists. We currently use about five different methods to communicate via written language. There is email for serious business and online order confirmations. There’s Facebook Messages for friends. There’s Chat for faster responses and friends on the computer. There’s text messaging for friends away from the computer. And there’s mail for bills and junk. There’s no standardization. All can converge into a single protocol, due to the commonality of text transmission, yet all exist completely separated. You may be saying, “I wouldn’t want my important bills popping up in a chat box anyway.” It doesn’t have to work like that. The universal text protocol could be more like email with filters, like being able to sort messages by unpaid bills, from friends, etc. In academia, over-divergence comes in the form of increasingly-specialized fields of study. All over the world, schooling goes from general to specific. Kids start learning general knowledge, and then get increasingly specific. After 13 years of this, a student decides what to specialize in, and keeps going further down. This is considered progress. I believe convergence should complement divergence. For example, if we learn 1+2=3, we should also learn the general concept of addition. By adulthood, no one is a generalist; no one is a Jack of all trades, master of none. As a field of study becomes increasingly specialized and distant from the layman’s level of understanding, there is greater chance for corruption. For example, specialists can falsify data for research grants from rich people who must blindly take their word because no one actually understands that field of study to that degree of specialization. Generalists are needed to bring specialization back to a layman’s (read: useful or human) level of understanding. In the workforce, over-divergence is, again, job specialization. There are no generalists to oversee all operations. No company looks to hire a generalist. You must be some sort of specialist to qualify for any job. A project manager has the title of a generalist but is still a specialist. Like academia, with increased specialization comes an increased chance for corruption. Specialists are blindly trusted due to their unique level of specialization. For example, a car mechanic can say your car has a bad flux capacitor and it’s going to cost $1000 to fix. A programmer can convince upper management that his algorithms, written in a special obscure programming language, are vital to his company’s success. I blindly respect people who work human-level, non -specialized, low-wage jobs because I know there is no chance of corruption. Besides corruption, another thing that over-divergence brings is more jobs, which, in today’s world, is always good thing. I don’t think so. In government, over-divergence means too many local government (state) laws and officials. An example of this is the recycling of aluminum cans. All these different redemption values are printed on a can. There is no good reason why a can should be worth more in Minnesota. It’s just unnecessarily complicated. There’s no convergence – no federal law saying “5 cents, everywhere”. Another example is sales tax. In a balanced world, there is a general and a specific tax, or in other words, a federal and a state tax. In California, it goes beyond a state tax and down to state plus county. This just complicates things. It also probably creates another job where the employees determine the appropriate local county sales tax rate. So it’s good, right? It unnecessarily complicates everyone’s life. In a country with over-divergence, there is no universal ID. You have a separate ID card for driving, for flying out of the country, for showing your grocery store club membership – all for no good reason. Every time you go to the doctor, dentist, DMV, etc. you have to fill out forms with all your information, because there’s no universal ID or accessible database. In today’s world of no convergence, there is no universal ID for the internet. Instead, everyone has to fill out their information and authenticate identity to check or send email, post an ad, read a forum, buy something, etc. Life with over-divergence is time-consuming and unnecessarily complicated. In food, over-divergence is variety beyond reason. For example, at a grocery store, there can be 500 different kinds of cereal. They all have more or less the same ingredients: rice, wheat, corn, oat, sugar, and a slight variation in flavor. This is just unnecessarily complicated for the store to keep inventory, make price tags, and restock shelves. It’s also anti-cost-effective for the cereal maker and consumer. Extreme uniqueness comes at a high price. At restaurants, over-divergence creates many unique menu items. An ideal balance of convergence and divergence means having a general ingredient or cooking method and applying divergence for different flavors and variations. e.g., Little Caesars Pizza, In-N-Out Burger. Most restaurants, however, have many different main entrees cooked many different ways. For example, Jack in the Box has burgers, fajita pitas, teriyaki bowls, salads, tacos, cakes, smoothies, shakes. There’s not much in common with these foods. This uniqueness is costly. In a culture of over-divergence, too much focus is on the individual (e.g. No Child Left Behind Act). There is too much neglect of the family, community, and nation. There is a shift away from generalizations, overall costs, overall ratings, and overall value. If you speak or think of these things, you will be scorned. For example, you are to never make a general statement about a population, even if you understand that outliers exist, because the statement is untrue for the entire 100%. Are you concerned about price tags? Society looks down on you. Do not ever put a price on health; if you have any medical issue, you are to spend whatever it costs to fix it, period. Do you summarize a woman’s physical beauty with a number? Scorned. Why does over-divergence exist? From kindergarten, we push ourselves to think and work in that direction. It’s how society has nurtured our brains (i.e. environment, not genetic). As a result, most people actually like over-divergence and see nothing wrong with the way things are. We enjoy choosing from 500 kinds of cereal. We demand it, so companies supply it, even if it’s bad for us.